You know you love it! 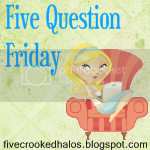 I know I do - Mama M's Five Question Friday! I love it in part because it means that even late in the evening, when I'm wiped out from a long week, and know that tomorrow brings no real rest because it's tax season and I'm working my fanny off, I can show up and write something without having to think super hard about it. So, yeah. Mama M - she does this little hoppity bop, throws down some questions for us to answer, and we all pop back over to her place and link up. Then we spend insane amounts of time going to everyone else's blogs reading what they said! Yep, I LOVE it!! A LOT. See, I work on computers. I'm on my laptop or other computers upwards of 14+ hours a weekday during tax season. Much of my work is internet based. My boss encourages (or at least, doesn't discourage) my use of various forms of social media - including here on my blog! Woohoo for cool bosses! Now, that being said, I don't have a lot of time to do a lot of "fun" computer stuff most of the time. But I really probably put in 12-14 hours a day on weekdays on the computer. Weekends are less, but depend on what sporting events are on, too. I will raise my children to pay their own way. I have some money I've set aside towards college, but I firmly believe that people have far more respect for that which they have paid for. Clothes, cars, educations, you name it, there is a greater value placed on it if it came from YOUR OWN pocket. You know what I'm sayin? Plus, the reality for me is that if all 3 of my kids go, I will have a senior, a sophomore and a freshman all at the same time. How the heck am I supposed to do THAT!? Yeah, um. A few. Only one was my fault, but I've had some winners. (No hot chocolate drama though, thankyouverymuch Mama M!) I once was part of a multi-car pile-up. The cop laughed when we called it in, not believing there really was a multi-car pile-up in front of our mall. There was. Myself and 2 other people were hit from behind by a young lady who was not paying much attention to that RED LIGHT. She plowed into us at like 40 mph. It was rather uncomfortable. I haven't had an accident in years, though. Like more than 10, I think. The one with words in it. Seriously, I will read almost anything. I love reading. Right now I'm reading a Beth Moore study with some friends. I've got a couple other books around the house that I'm working on, too. Some all time faves though include the Clan of the Cave Bear (and sequels), Little Women (and sequels) and the Harry Potter series. Uh, no. I'm not afraid to admit it. I kind of flip the blankets up, so it sort of looks made, but it's not. Know what else? My laundry is not folded. In fact, most of it is in piles on my couch, or baskets in the hallway upstairs. Floor needs swept, too. Dishes are mostly washed, but the counter probably needs wiped down. And I'm pretty sure there is toothpaste in my bathroom sink. Martha Stewart I am not. Deal with it. So, there you have it. In all of it's glory, my answers for this week's 5QF. You are invited to play along. If you have no blog, that's cool, we won't hold it against you. You may answer in the comments section. K, lots of fun, but now, off to my house! Hasta Manana, mis amigos! I'm not a bed maker either and I don't even go so far to throw the blankets up, we just leave it a jumbled mess and crawl back in to mess it up more the next night. I T-totally agree with your thoughts on a college education. Even more now that I know you love the Clan of the Cave Bears...who calls for a GOOD sequel to that movie?!! !